Bill Murray from a scene in Groundhog Day will be participating in the 20th Anniversary party for the movie that begins July 13th in Phoenix, Arizona. 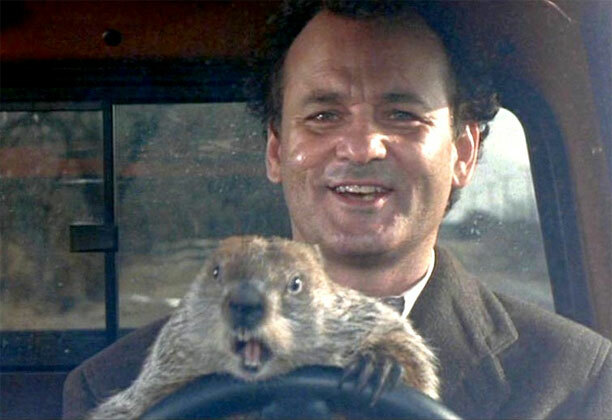 Culver City, CA — The day that would never end for Bill Murray is turning 20-years-old and the cult classic Groundhog Day is celebrating it properly with a 29-city movie reunion tour that kicks off in Phoenix, Arizona on July 13th. Included in the tour will be cast members Bill Murray, Chris Elliott, Andie MacDowell and Stephen Tobolowsky. 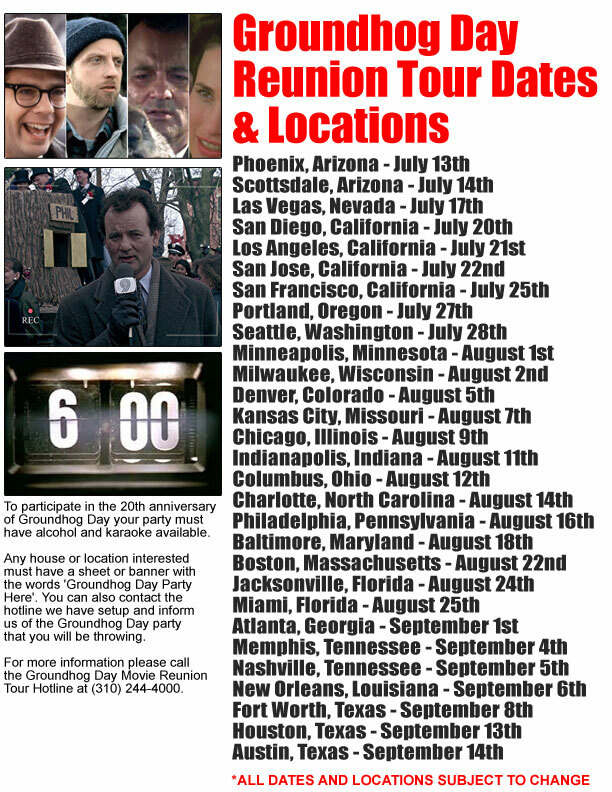 It is unclear the exact parties they plan to attend, but if you live in any of the cities listed on the tour, the main characters from Groundhog Day might just be partying with you. For those not familiar with the movie; it centers around an arrogant and egocentric Pittsburgh TV weatherman (Murray) who is reluctantly sent to cover a story about Groundhog Day. This is the fourth year in a row that he has done the story and makes no effort to hide his frustration. The following day he finds himself in a time loop, repeating the same day over and over again. Groundhog Day has been considered a tale of self-improvement which emphasizes the need to look inside oneself and realize that the only satisfaction in life comes from turning outward and concerning oneself with others rather than concentrating solely on one’s own wants and desires. According to the website Wolf Gnards, Murray’s character Phil Connors spends 8 years, 8 months and 16 days trapped in Groundhog Day. The odd moment of the press conference came when 27-year-old Eli Kluger from Phoenix, Arizona told reporters he thought Rick Moranis was in Groundhog Day. “Wasn’t Rick Moranis in Groundhog Day, or am I thinking of another movie?” That is when all the reporters in attendance laughed and pointed at him for being stupid or attempting to be funny. The Groundhog Day Movie Reunion Tour kicks off July 13th in Phoenix, Arizona and will end September 14th in Austin, Texas. For a complete list of dates and locations of this tour, click here. For more information please call the 24-hour Groundhog Day Movie Reunion Tour Hotline at (310) 244-4000. I love this movie so much! Oooh, they’ll be in Minneapolis on August 1st… I’m throwing a party for sure… don’t even care if they show up or not. YEAH! Can’t wait to see Bill Murray again in Austin! 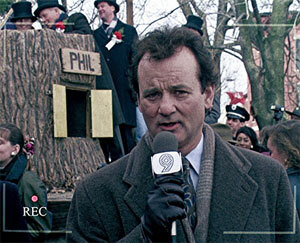 According to the website Wolf Gnards, Murray’s character Phil Connors spends 8 years, 8 months and 16 days trapped in Groundhog Day. Saw this press release about this… can’t wait! BILL FRICKIN’ MURRAY!!!!!! I LOVE THIS MOVIE SO MUCH!!!!! Seriously how awesome is this!!!!! Another great Press Release about this upcoming tour!!! This party in Phoenix on the 13th looks pretty awesome. I’m thinking about going. I live right by there too so even if it’s not fun I can always just leave early. Excellent posting over here about this tour! There was a lot of improvisation in this movie that some people might not know about. One example is the whole scene where Bill Murray gets gay with Ned Ryerson… none of that was not in the script. It just happened. Pretty rad.